I bet that title has you wondering! It was certainly new to me when I came across a book in my late mother-in-law’s collection titled Fellows all: The chronicles of the Bread and Cheese Club. Published in 1943, and written by HW Malloch, this book is a history of the early years of the club by its first voted-in member. I was intrigued, of course, so did some research. The Bread and Cheese Club, as it turns out was formed in Melbourne in June 1938. Its motto was “Mateship, Art and Letters”, and it was particularly active in promoting Australian writers. The Club apparently published around “40 volumes of verse and tributes” as well as a journal titled Bohemia. The founder* and Knight Grand Cheese (oh dear!) was John Kinmont Moir (1893-1958), a Melbourne book-collector. He apparently died in 1958, and the club gradually declined, finally ending in 1988. I wonder how many Melburnians know about it now? Delving further, I learnt a little more about Moir and the club. Moir, in particular, is a rather significant man in Australian letters. According to the State Library of Victoria, Moir, from the 1930s to 1950s, “set himself the daunting task of collecting one copy of every work of fiction, poetry and drama ever published by an Australian author.” This, they said, at a time when Australian literary authors were neither fashionably read nor collected. The result was “one of the finest private libraries of Australian literature ever assembled”, one that he donated to the State Library in the 1950s. It remains one of their most significant collections. You can read more about him – and it’s an interesting story – online in the State Library’s La Trobe Journal. But, back to the Club. It was male only. The twelve founding members included the poet John Shaw Neilson (1872-1942) and balladist Edward Harrington. According to Malloch, the unusual name was chosen because they wanted something “Bohemian” and “arresting”, and it had the desired effect: it made people curious and provided an opportunity for members to explain their aims. Malloch tells a lovely story, too, about one of its practices – quaint to our point of view but indicative of their era – which was making it “a penal offence” to address each other as “Mister”. Doing so incurred a fine of one penny which helped, in the early days at least, to swell the club’s coffers! It did this not only through publishing but by undertaking a wide range of projects and activities such as art exhibitions, song of the year competitions, short story competitions, and lobbying government. Malloch describes some of the earliest activities, including a short story competition which was judged by Nettie Palmer. Searching the National Library of Australia’s digitised newspaper database in Trove provides a fascinating picture of the breadth of the Club’s** activities. One report states that the Bread and Cheese Club was behind the Commonwealth Government’s providing a grant for the writing of a biography about JF Archibald, the founder of The Bulletin. The club also invited guest speakers, and often opened those meetings to the public. Malloch tells us that these speakers included artist Max Meldrum, indigenous Australian activist, pastor and state governor Doug Nicholls, and journalist-author Frank Clune. I could go on … it’s a fascinating story of passion and commitment to Australian culture. They even printed 50,000 stickers with such slogans as “Combine Pleasure and Patriotism and Read Australian Books” and “Let Your Christmas Gift be an Australian Book”. Where are these people now! Finally, before I go, I can’t resist sharing one of those odd little reading synchronicities. I have, as my regular readers know, just read Eleanor Catton’s The luminaries. It starts with 12 men gathered in a hotel room, but they became 13 when a hotel guest wanders in. The Bread and Cheese Club started when 12 men met in a studio with the aim of “fostering Australian Art and Literature”. Having had their meeting, they adjourned to a nearby “city hostelry” where they met Malloch, and promptly asked him to join them. And so, he writes, there were 13. I know, I’m being silly, but I enjoy such, dare I call them, coincidences! * POSTSCRIPT: While some reports describe Moir as the founder, Malloch’s book doesn’t state this. On page 10, he writes that: “Twelve turned up at the studio of Fellow E. J. Turner, 132 Cubitt Street, Richmond, and set the ball rolling with the definite aim of fostering Australian Art and Literature”. And on page 13, he specifically names these twelve as “the founders”. Moir was elected president (aka Knight Grand Cheese) and Turner secretary (or Worthy Scribe). ** Searching Trove surprisingly retrieves another Bread and Cheese Club in Melbourne! Malloch tells us briefly about that too. It was a very small club of solicitors and in 1859 merged into the Law Institute of Victoria. That’s a wonderful piece of Australian cultural history – I found it absolutely fascinating. Thanks Vicki … I was hoping that would be the reaction. I was quite chuffed when I came across it. This is amazing. I’ll have to look at the article of his collection. Great post. Thanks, TP! Hope you enjoy the article. He was an interesting man. Of course, I’d have preferred a Wine and Cheese Club Hannah. Methinks you aren’t remembering what Big Block of Cheese Day is… or that OBAMA IS DOING A REAL ONE IN REAL LIFE SOON OMG THE WEST WING IS BECOMING REAL that is all. No I’m not remembering in fact! I enjoyed West Wing but it’s not imprinted on my soul! Great post, Sue. I am a regular reader and am constantly rewarded. It would be fascinating to learn which books they read and any comments. Did they read women writers? If so, what would they have made of Kylie Tennant, say, or Ruth Park, or (the mind boggles) Pritchard? Thanks Sara … I was nearly going to mention those writers – and Barnard, Eldershaw and Davison – when I mentioned Moir’s politics. But, while they clearly knew people like Nettie Palmer, and women won some of their competitions, it sounds typically patriarchal for the times. Noir would have collected their works I’m sure, but … Reading them, perhaps not so much! ‘Knight Grand Cheese’ – I love it. They obviously had a sense of humour (collectively and individually, I hope). What they obviously didn’t have was any sense of human rights – well, not enough to include women anyway – ‘mateship and fellowship among *persons* of mutual interests’ – where were their women members? At least there were women among their competition winners. But a great post on what sounds like an interesting group. Thanks LL … I guess they were very much of their day! They make a big point of WHEN women were allowed in on occasions as though it’s a special privilege. Moir himself had been married twice but was a bachelor by his 40s. You sent me searching Sue. I was born and raised in Melbourne and had never heard of the club until I read your posting. Intriguing information, and great to read; but what a pity it was such a men’s club. I’m not surprised Meg. They were such a men’s club, and their activities waned a lot after Moir’s death in 1958 it seems. Yes, a pity about the men’s only bit. I’m not totally anti gendered groups – such as women’s only reading groups, or the men’s shed movement – but this was more than a small informal group. They were actively, publicly promoting Aussie arts and to not include women in their membership is a real shame. Yes, Meg, she’s mentioned in Fellows All, with even a photo – she let them meet at her house until they grew too big and she provided hospitality (of course!). I expect she never actually went to meetings – particularly after they moved from her house! As you say, those were the days – a concession to the little woman! I remember once in Melbourne catching up with a friend retired-as-widow out of the Albury Tabletop locale. Early 1980s? She took us to Jimmy Watson’s Wine Bar in Carlton – and introduced my wife and I to some of her friends in “The Monday Club” (mostly – in those days – members of the ABC – radio I think) – and a jolly lunch-time was spent. As a student at Sydney University I spent a year “in digs” in the home of “Joy” – the widow of Esmonde Macdonald HIGGINS (1897-1960) – the younger brother of Nettie (née HIGGINS) PALMER. 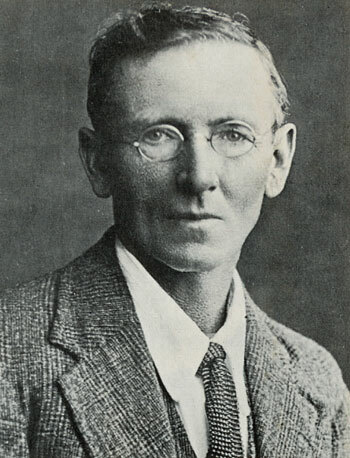 Esmonde studied at Balliol in Oxford – served in the Great War – was on relatively comradely terms with TROSTSKY, apparently – and on his return to Australia became involved with WEA. It was his uncle Henry Bournes HIGGINS who financed his education at Oxford – more-or-less adopting Esmonde following the early death of his own son. While resident (aged then 18, 19) I knew none of this Australian history/background. It was 1968. Years later I came across the son who had returned to Australia with his Scottish bride and two children I think just before I moved out of the Croydon family home. Over breakfast I would test “Joy” on her conversational Italian – and occasionally she would drag me along to Meals-on-Wheels delivery. How the other half lived. Important learning for me! My strong focus on Australian Literature got underway after working on Jim & Barbara MULLER’s farm at Eurunderee (near Mudgee) – packing gherkins for their later commercial packaging – but one farm removed from where Henry LAWSON grew up. Perhaps I’ve mentioned this before. I haunted second-hand bookshops through the early 1980s – Cornstalks of Glebe, especially! I have a huge library. I left several hundred Australian books behind in Japan when I left there coming up five years ago – sent to the foreign language section of the city library – where they were happily received. At The Ritz Café in Adamstown this morning following my regular walk of the Fernleigh Track from Belmont (c. 16 kms) – conversation with one of the co-owners who had lived for years in Mudgee revolved around a rosary of names we each recalled – including Jim & Barbara MULLER. The wife of one of the co-owners had mentioned something about the Peloponnese – I threw in an oblique reference to a (writer) friend of mine living there – and adding that the best olives in the world are from Kalamata. Now they would have gone down a treat with the Bread and Cheese Club – I reckon! Great story, thanks Jim. And good on you for donating your collection to the library in Japan. It’s great to think Aussie lit has a bit of a home there. Did you meet Nettie Palmer. She was such a mentor for women writers in her day, wasn’t she. How wonderful such an institution would be, Sue … But not for men only, of course! Just think how all the lazy readers (ahem!) could be taught to cudgel their ancient brains and read serious stuff … ‘T would be a little ripper. Oh but MR, I don’t think you had to only read serious stuff to be a member! But if you wanted to be cudgelled into reading serious stuff I’m sure you could find a local reading group to oblige! I have tried the odd reading group. They are not for me. Fair enough. Reading groups do vary. You could always create one of like-minded souls! I’m sure they’d love to be hectored by you MR! Do keep thinking – a good reading/discussion group is worth a lot. But it can be a challenge getting the right mix, as I bet you know! Oh I love that Lisa – Seafood and Chardonnay! What happened to it? Oh, it was rather sad. The friend who used to organise it got cancer and died, and none of us had the heart – or the skills – to go on with it after that. I’ve still got my little membership badge, though, and wonderful memories. That is sad, Lisa … Interesting how much groups can rely on one or two people holding them together … But you had a badge! What did it look like. A lobster holding a glass of wine? No fear, it was a classy little rectangular brooch with a blue wave running along the lower edge. Sounds lovely … Of course it was classy! I was joking, really. What an interesting story – quite a noteworthy association of people I would think. And I love Jim’s comment above. Thanks Tom … They certainly did a lot … I think i’m going to do a follow up post with some storis. Haha Stephanie. Couldn’t have put it better myself! I think other men’s clubs in the past have gone in for funny names … Perhaps it’s more of an English tradition? Intriguing! I wonder if there was a women’s equivalent somewhere? I have enjoyed the comments and the stories that you have produced. I would just like to let you know that I am a daughter of Edgar James Turner (Ted) who actually was the original member to start the Bread and Cheese Club in a room of our home in Richmond in 1938. My Grandmother Susan Turner who was the Patroness and only female member loved ever minute of the group being in her home and the men who were a part of it. It is wonderful to see this information being put out there, but it is very frustrating to always see some one else be given the credit for something they did not do. Thanks Pauline. I appreciate your contributing your knowledge. How exciting to have been associated with such a group! I was aware that there were 12 men, as I wrote in my first post. My book Fellows all, which says they met in EJ Turner’s home, didn’t say he was the founder, but that all twelve were. It says that a Neil Rankin came up with the name. There is a lovely photo of Susan Turner in the book. It says she was made Patroness and as such was made the only female member. There’s also a photo of your dad, as you probably know. I understand he was the first secretary … Or Worthy Scribe? While Moir was one of the 12, he was Knight Grand Cheese and I gather drove most of the club’s activities, but perhaps Malloch overstates his role? Certainly, it’s his name that pops up most in newspaper reports that I’ve read. Pauline, I have added a postscript to clarify Malloch’s statement about the founding of the club. Thankyou for bringing it to my attention. whisperinggums ,Thank you for the postscript, yes i have the book my three children also have a copy . It’s a pleasure Pauline … I don’t like to think I don’t listen and the beauty of blogs is that they are dynamic! whisperinggums the bread and cheese club is not the only story to come out of my home. Martha Needle Australia;s most evil woman poisoned her whole family with Rough on rats. Oh dear, Pauline! Do you still live there? Do you still live there? Oh that’s sad. One of the houses I lived in has been demolished – it is now, I believe, the carpark for a MacDonalds!